Our Programme Manager David, has just returned from a year in Tanzania working with our partner organisations. This is his account of the projects and work he undertook during that time. In November 2014 I moved to Arusha in Northern Tanzania with my family. We lived there together for a year. We rented a house and my son went to school. Arusha has a population of around 400,000 and sits on the Southern slopes of Mount Meru, and on clear days from certain parts of town you can see Mount Kilimajaro. I spent the year working closely with four African Initiatives local partner organisations. These are Tanzanian NGOs who have their offices in Arusha and who we support to deliver projects. 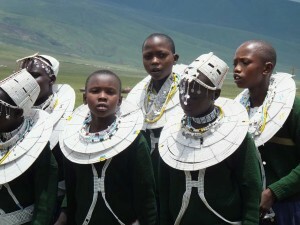 One of African Initiatives’ partner organisations, PWC (Pastoral Women’s Council) work in the Ngorongoro Conservation Area. 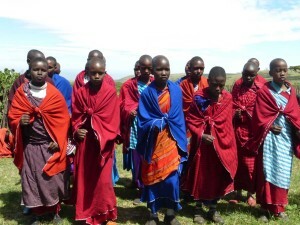 Maasai communities continue to live within the NCA, unlike other National Parks which have no human settlements. We have recently supported PWC to deliver a primary school education project called ‘Song & Dance’ with an emphasis on getting more Maasai girls into primary school. This project worked across ten primary schools for three years. 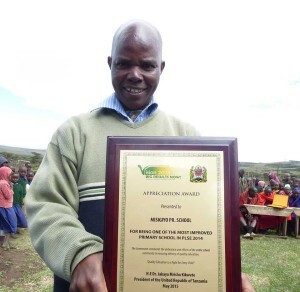 One of the schools, Misigiyo Primary School, received national recognition for being one of the best improving primary schools in the country. 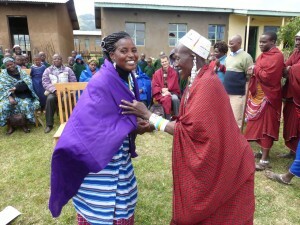 Reci, the PWC Primary Education Project Officer, is a role model for the Maasai women and girls, as she managed to secure herself an education and get employment. 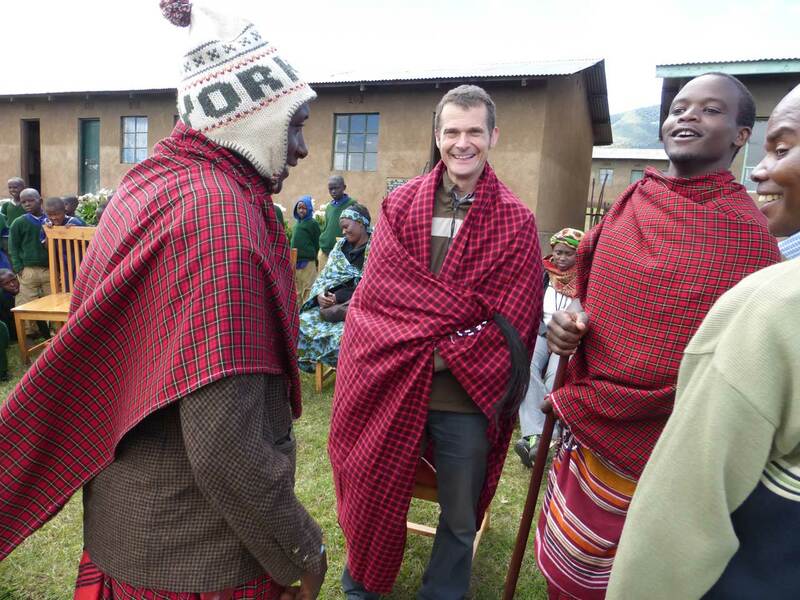 The local Maasai community at Misigiyo Primary School gave me a Maasai name ‘Olosyoki’ which means ‘He who works fast’ in acknowledgement of the speed at which the school has improved these past three years. African Initiatives’ new Education project is called ‘The Equal Rights to Quality Education’ project. It is looking to build on the success of the ‘Song & Dance’ project; to get more children into school, keep them in school and to help them make the most of their time in school both academically and socially. The project is working with 70 primary and secondary schools across six districts in Tanzania. Misigiyo is one of these project schools, and we look forward to continuing to work with both the school and the community. The Equal Rights Project is investing in both Teacher Training and School Inspections. The project works with primary and secondary schools highlighting their roles and responsibilities to children. Partners are working to increase communication between parents and schools to address students issues such as drop-out rates and performance. Partners are advocating for better teach training and educational budgets for girls. At community level, project partners work with traditional leaders, parents and Ward Development Committees. Vulnerabale children are identified and referred for support. This project will work towards securing equal numbers of boys and girls attending school. The education system in Tanzania is struggling to cope with the growth of the population. There are still one million children who are not in school, yet the population grew by over 10 million in the past decade. Evidence shows that boy’s education faces challenges as well and it is unlikely the current education provisions will match the growing population. Children are not acquiring foundation skills in literacy and numeracy and these problems continue through to secondary school and further, with some of the students becoming teachers themselves.This reinforces cycles of failure and coincides with brighter students attracted to better paid jobs than teaching due to lack of incentives and housing in the rural areas where educators are needed. Half of students in secondary school are sexually active with 8,000 girls dropping out annually due to pregnancy. Studies show that Gender Based Violence is endemic in schools with 16.7% of girls reporting GBV at school and 78% reporting physical abuse. A project baseline study revealed that less than 50% of students felt that cases of abuse were being reported in their school.Girls living in pastoralist communities are particularly at risk by family displacement, initiation ceremonies (Esoto), Female Genital Mutilation (FGM) and early and forced marriage. 70% to 90% of teenage pastoralist girls are married. There are often hidden costs to education and a lack of cooperation between parents and teachers.. Male dominated hierarchies in charge of education are often unaware of girls’ right to education or national policies supporting girls. Project partners provide training, mentoring and support to teachers at school, ward and district levels to diversify teaching methodologies and improve classroom behaviour and participation.Partners support government primary and secondary school inspectorates by accompanying school visits and by assisting in the establishment and delivery of quality monitoring processes. Head teacher workshops will look to embed good practice into the on-going management of schools.The project will work towards securing equal numbers of boys and girls succeeding at school. Only 50% of parents and local leaders felt that they were able to do anything to improve their local schools.The project has established a network of Girls/Health Clubs in participating schools. Clubs provide a forum for students to support one another socially and academically. Club members act as peer educators for the wider school population. In five years we are hoping to train and empower 5,000 primary school club members and 3,000 secondary school club members. The project will strengthen school-wide, traditional Baraza governance structures. Girls and boys from each year are elected annually to represent their peers to school governing committees and teachers. They will have a genuine voice in decision-making, and increase the participation of children in their schools. Project partners will work with teachers to develop, implement and monitor Child Protection policies and practices. Training will be provided on child rights, ethical relationships, Gender Based Violence and HIV. The project will work towards making schools safer and happier places for all.